Made of an unbreakable ABS housing with a high impact polycarbonate lens and thermoplastic rubber shroud. INCLUDES: Dual filament Xenon safety lamp with 60 hours of lamp life (30 hours each), protective lens shroud, and a patented shock absorbing internal battery module that protects 8 D-Cells from hard abuse. 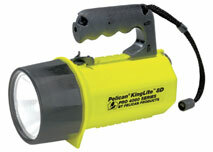 Combination pistol grip/lantern handle quickly converts to multiple positions. Choice of Laser Spot or Modified Spot quick change reflectors. Operates 10-12 hours on 8 D-cell alkaline batteries (not included). NO 251.4 14.4 100,000 8D 10-12 hours 9 3/8" 4.63 lbs.